Halloween is over, so we’ve had our fill of pumpkin beer. Now we're all about hard cider. The age-old beverage has gotten more and more popular recently, becoming a fixture on many American bar menus, with a cider tap right next to the draft beers. But as tasty as cider is on its own, its natural acidity and lift make it a perfect cocktail ingredient. 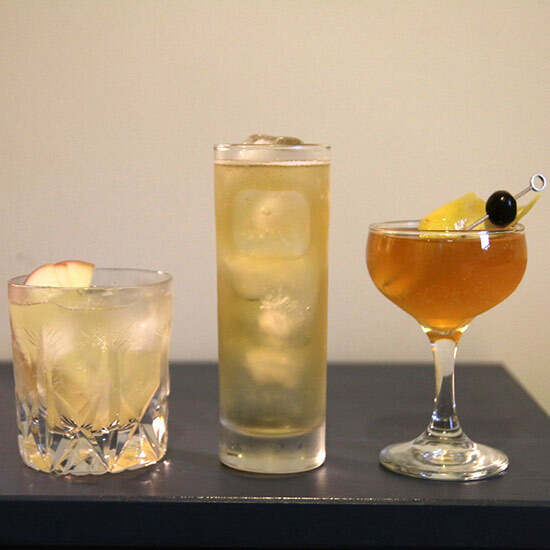 Dump just about any brown spirit in cider and you've got a killer drink; opt for one of these slightly more complex cocktails and you'll get an incredibly sophisticated drink with minimal effort. This is John's super-easy behind-the-bar drink at work: hard cider with a little rye dumped in. We like the spiciness of High West's Rendezvous Rye, but use whatever you've got on hand. Instructions: In a tall glass with ice, combine 1 ounce of rye and 4 ounces hard cider. We love a dash of Angostura bitters in there, too, but they're not mandatory. No need for a garnish; just drink and repeat. It's hard to get more celebratory than Scotch and bubbles, and this cocktail combines a rich blended Scotch (we're using Cutty Sark Prohibition) and the bright sparkle of hard cider. Instructions: In a mixing glass with ice, combine 2 ounces of blended Scotch, ¼ ounce of honey syrup (honey cut with an equal part of hot water, so it dissolves) and 2 dashes of Angostura bitters. Stir that all up until nice and cold, then strain into a cocktail glass. Top with two ounces of hard cider, and garnish with a lemon peel and a cherry. Apples and tequila? It sounds like an unlikely combination. But good silver tequila can be a little grassy and a little sharp; apples mesh with those flavors and mellow everything out. And the cider not only ups the apple quotient, but adds a welcome bubbly float. Instructions: In the bottom of a cocktail shaker, muddle a quarter of an apple (we're using a Red Delicious). Add an ounce and a half of silver tequila (we're using Roca Patrón) and a quarter-ounce of agave syrup—that's equal parts agave cut with hot water until it dissolves. Simple syrup will work if you can't get your hands on agave. Shake all that up hard with ice, then double strain (through the cocktail's own strainer, and a fine strainer) into a rocks glass with ice. Top with two ounces of hard cider. Garnish with a few apple slices.